Attention all interested customers; come back to check on available leases often as they are posted when they become availabe! We will not call you, take your name or put you on a list. It is "First Come, First Served". If you are looking for a slip to buy you have come to the right place. Also, if you are looking to sell your slip be sure and ask us about a website listing and download the checklist below. This slip is currently leased. Occasionally we have slips and summer mooring available. All slips are privately owned and from time to time slip owners make their slips available for lease. Standard leases ranging anywhere from a minimum of 6 month to several years. If this is what you are looking for this may be the right spot for you. Come and be our guest here at Cliffside Marina. All visitors need to contact the Marina Office and register their vessel prior to arrival. Vessels docking without permission from the Marina Manager are subject to removal. Gate fobs and Card Keys are not transferable. Any fob or card not in possession of the owner will be deactivated. Cliffside Marina is a gated and secure facility. Download the complete Lease Package here. 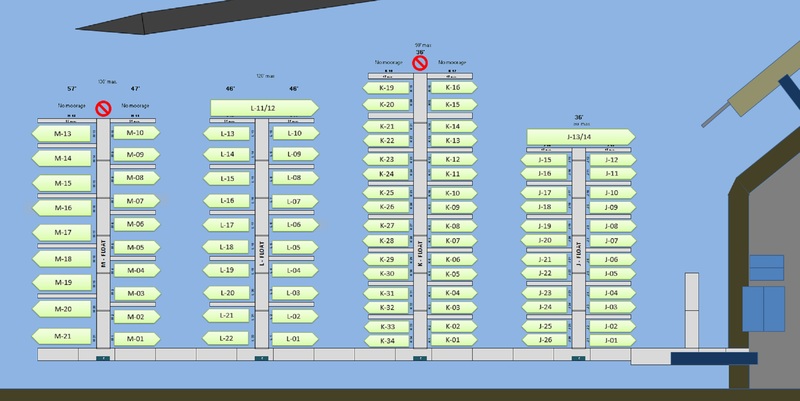 Download the Marina float layout. For your convenience, we have made this layout downloadable.